Curiously, Samsung make a bit of an effort not to disclose the exact make and model of processor powering the ATIV Book 9-Lite notebook. A little digging quickly reveals the Samsung ATIV Book 9-Lite NP915S3G-K01 notebook is built around an AMD A6-1450 'Kabini' APU, introduced in Spring 2013 and built on the 28nm manufacturing process primarily for the tablet & entry-level laptop markets. The AMD A6-1450 APU is 4 core / 4 thread processor with 2MB of L2 cache and 0MB of L3 cache. The APU fluctuates between a peak clock speed of 1.4GHz and 1.0GHz, depending on system load. Small heatsink and fan to cool the 8W AMD A6-1450 APU. The 1.0-1.4GHz AMD 'Kabini' APU doesn't produce all that much heat so a simple flattened heatpipe and low noise squirrel cage fan are enough to keep the notebook from overheating. In use this fan proved to be inaudible. 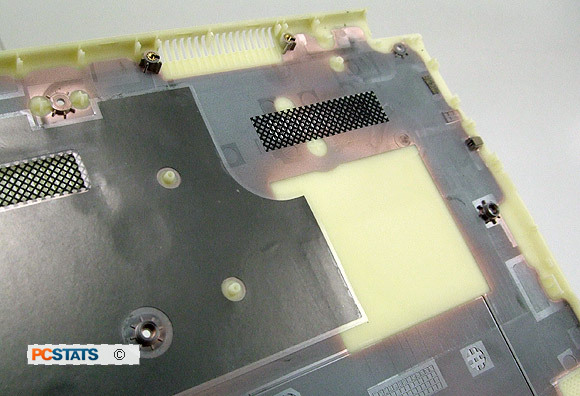 Since the notebook chassis is made from PA-GF50 plastic, Samsung engineers make use of a large graphite heat conducting sheet to keep hot spots from developing around the processor and heatsink regions. As with all modern processors, the CPU and integrated graphics have been integrated on to the same chip to save space and power. Within the AMD A6-1450 APU we find a Radeon HD 8250 graphics core powering the Samsung ATIV Book 9-Lite graphics capabilities. The Radeon HD 8250 is not an exceptionally powerful IGP, it has 128 Radeon cores running at a modest 300MHz - 400MHz. 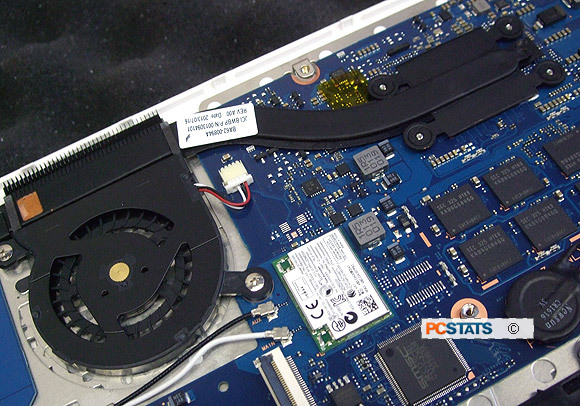 The APU is designed for DDR3-1066 memory, of which the GPU syphons off roughly 450MB for itself from the ATIV's fixed 4GB of system memory. 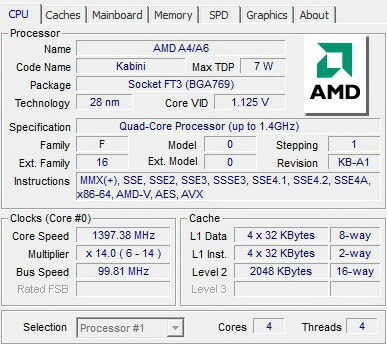 The notebook mainboard appears to be built around the AMD H55M chipset. The AMD Radeon HD 8250 graphics core supports DX11.1, Shader Model 5.0, DirectCompute5.0, UVD 4.2, VCE2.0 and HDMI 1.4a standards. In an entry level notebook such as this, the Radeon HD 8250 won't handle much in the way of gaming, but its 128 unified shaders do achieve a texture/pixel fill rate of 20.8 GTexel/s and Bandwidth of 8.5GB/s which is sufficient for HD movie playback. The graphics benchmarks peg the Radeon HD 8250 IGP a little lower than an Intel HD 4000 IGP in terms of "gaming" performance.... and yes, we're using "gaming" in the lightest sense of the word. 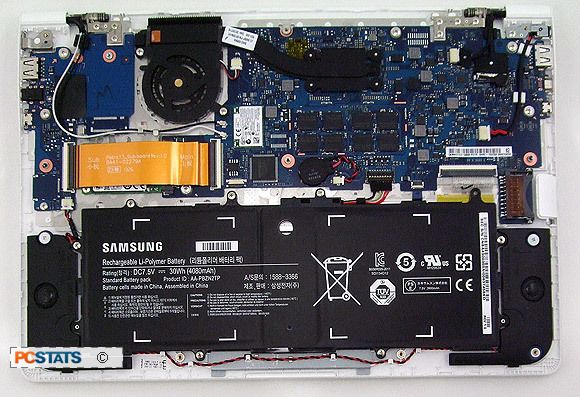 A look inside the Samsung ATIV Book 9-Lite NP915S3G-K01 reveals this laptop is built pretty much like a tablet, but with a keyboard. Other than the mSATA SSD and Li-polymer battery cell, everything is built into one monolithic motherboard.